This webpage is devoted to our current specials, new and featured products and special prices that we offer our valued customers in order to help celebrate all things that are worth celebrating: Our seasons and our holidays! In France, a "Boulangerie" is a store that generally sells bread. A "Pâtisserie" is a store that generally sells pastries. At Rêver Artisan Bakery, we sell both! To the absolute delight of our customers! The best sandwiches start with great bread, freshly baked each day using only high-quality ingredients: Just waiting to be inspired by your favorite cheese, vegetable or meat options. For ideas about what you can do with our Rêver Artisan Bakery™ sandwich breads and rolls, just scroll down. Americans eat more than 300 million sandwiches every day: A pretty large amount considering there are slightly more than 300 million Americans! Also, 69% of Restaurant across our country offer sandwiches on their menus! The origins of the hands-on meal date back centuries, but it was popularized in 1700s England by John Montagu, the fourth Earl of Sandwich, who ordered beef between slices of bread so that he could eat while continuing to play cards. Some 250 years later, the humble sandwich has grown to encompass infinite regional variations while serving as the perfect portable repast for our mobile lifestyles. In honor of Tuesday's National Sandwich Day, here's a closer look at the many flavors we can pack between pieces of baked goods. When eating out, Americans favor more elaborate submarine or cheesesteak sandwiches. When at home, though, we prefer simpler ones such as peanut butter and jelly or grilled cheese. In other words, if we have to make a sandwich ourselves, we can get a little bit lazy. In 2012, the Travel Channel pitted sandwiches from around the country against each other in a tournament-bracket format. The winner was a roast pork sandwich, topped with provolone and pork gravy, from Tommy DiNic's in Philadelphia. Their roast pork sandwich is as classic as it gets: Moist, paper-thin slices of roast pork, sharp provolone, a hefty topping of bright, perfectly cooked broccoli rabe, and a splash of gravy. Runners up in the meat-centric competition, hosted by Adam Richman, were the "Chicken Conquistador" sandwich, a marinated grilled chicken topped with secret sauces at Zunzi's in Savannah, Georgia; and "The Yardbird," a sandwich with hickory-smoked chicken, cheddar cheese and applewood-smoked bacon from Slows Bar-B-Q in Detroit, Michigan. The world's most expensive sandwich! The Quintessential Grilled Cheese Sandwich, from Serendipity 3 restaurant/general store in New York City is the world's most expensive sandwich. If you would like to save $214 plus the cost of a trip to New York City, you can make your own using Rêver Artisan Bakery™ sandwich loaves! Just follow the instructions in the video to the right. A submarine sandwich, served on a long roll, is pretty much the same all over. Unless you're in New York, where it's called a hero. Or in Philadelphia, where it's a hoagie. Or in Boston, where it's a grinder (or a "grindah"). Confused yet? Then there are many distinct regional sandwiches, from lobster rolls (Maine) to Cubans (Miami) to cheesesteaks (Philly, duh) to po' boys (New Orleans) to loose-meat sandwiches (Iowa) to brisket (Texas) to BBQ Kalua pork (Hawaii) to the bacon, fried banana and peanut butter sandwiches that Elvis made famous in Memphis and Mississippi. And in some ethnic quarters of the United States, you can get a shawarma (a Middle Eastern sandwich, usually grilled meat in a pita), a Spanish bocadillo (often cold cuts or sausage on rustic bread) or a bahn mi (a Vietnamese sandwich with meat and picked veggies on a baguette). The largest-ever sandwich, according to Guinness, was a corned-beef monstrosity made in 2005 by staffers at Wild Woody's Chill and Grill in Roseville, Michigan. It tipped the scales at a whopping 5,440 pounds, or more than 2 tons. The longest sandwich ever was made in 2011 in Beirut, Lebanon, and measured more than 2,411 feet. (Its ingredients included chicken breast, lettuce, tomato and spices.) Four movable ovens were created especially to bake one long continuous piece of bread. Ingredients: Shaved slow-roasted rotisserie lamb, roasted tomatoes, goat cheese, cilantro pesto, horseradish-Dijon mayonnaise, red onions and baby arugula on pumpernickel. In Celebration of National Sandwich Month, we have searched the web to find exceptional sandwich recipes to elevate the humble sandwich to gourmet status (what we affectionately call, "super" sandwiches)! All of the following recipes can be made with our Rêver Artisan Bakery™ French and Italian Sandwich Loves and rolls. For a softer crust, just order our Italian style rolls. THE ULTIMATE SPICY STREET FOOD! As for street food, Vietnam offers a thrilling array of choices. Salad bowls, soups, chicken wings, and spring rolls are all sold curbside to hungry passers. Yet above all these, reigns the Vietnamese Banh Mi Sandwich. A good Cuban sandwich is like a ham-and-cheese on steroids. This one is packed with ham, salami, home-roasted pork loin, two kinds of cheese and a pickle-mustard relish. Approaching tuna-melt perfection, Tommy Habetz's Oregon Tuna Sandwich has the ideal tuna-to-cheese ratio. His smart idea: using balsamic vinaigrette in place of mayonnaise. This sandwich is ridiculously healthy and so dang good! There’s NO dairy or animal products, and it uses mostly fresh vegetables, which means plant-powered nutrition! There is NO reason to miss meat with this Vegan sandwich! THE ULTIMATE SPICY REUBEN SANDWICH! 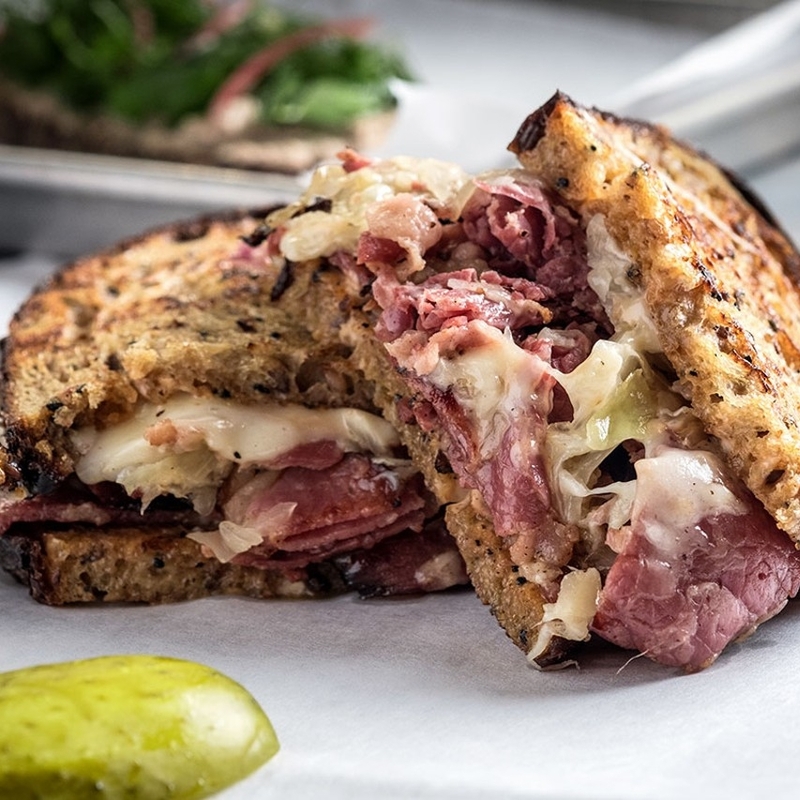 A Reuben is traditionally made with corned beef, which, like pastrami, is cured brisket. But because pastrami gets spiced and smoked, it packs way more flavor, especially Waghu! For the entire month of August, you can enjoy our Rêver Artisan Bakery™ sandwich loaves and hoagie rolls for $1 off! The best sandwiches use the best artisan ingredients, including fermented breads. We encourage you to be artistic and creative (and of course, use our breads) when it comes to you sandwich masterpieces! To order our Rêver Artisan™ Sandwich Loaves and Hoagie Rolls, at $1 off, please use the form below. Treat your relatives or friends to some baked-to-order goodness. A Gift Certificate is a great way for them to sample our products risk free. $10 Gift Certificate for $8! $25 Gift Certificate for $20! During the Month of July we will be discounting our Gift Certificates to give new customers a chance to sample our products. (This special is valid for new customers only, and as always, comes with risk free guarantee!) To take advantage of this special, just use the form below. VALID FOR NEW CUSTOMERS ONLY (TO GIVE THEM A CHANCE TO SAMPLE OUR PRODUCTS), AND AS ALWAYS COMES WITH A RISK FREE GUARANTEE!